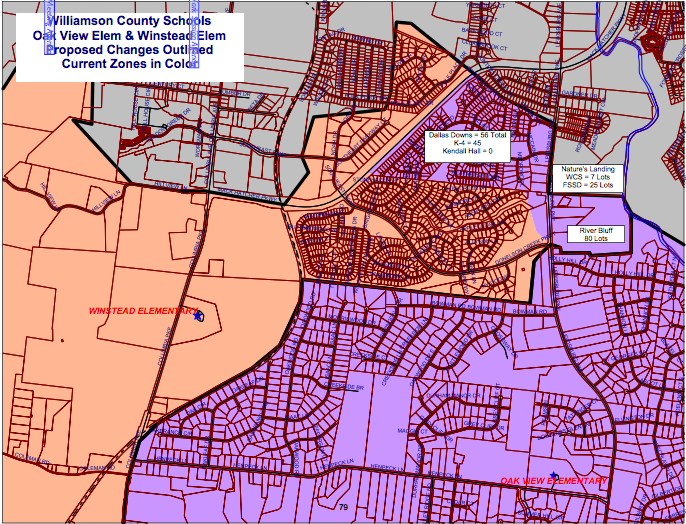 The Williamson County School Board voted to rezone Nature’s Landing and River Bluff, but exempted the Dallas Downs community for now. The motion to exempt Dallas Downs was brought by Mark Gregory, the representative from District 11, where the communities in question are located. Nature’s Landing and River Bluff are new developments. Dallas Downs is currently zoned for Oak View Elementary, where it will stay. It would have been rezoned for Winstead Elementary without the exemption. When proposing the amendment Gregory said, “I would prefer we don’t do a spot rezoning like this, especially if we’re going to do a comprehensive rezoning a year from now,” which Superitendent Dr. Mike Looney promised at a recent meeting with parents. PJ Mezera supported Gregory saying the board should take cues from him given the proposal would impact his district most. The amendment to remove Dallas Downs from the proposal passed 8-4. The proposal to rezone the remaining subdivisions passed 12-0. Amber Stewart reports for Home Page Media Group. She can be reached by email at amber@homepagemediagroup.com or on Twitter @Amber_BHP.